DREAM WHIP and yogurt make a simple 2-ingredient dip - pair it with cut-up fruit for a fresh and fruity appetizer that's perfect for summertime entertaining. COMBINE 1 evelope prepared DREAM WHIP Topping Mix with 1 tub (175 g) of any flavoured yogurt. 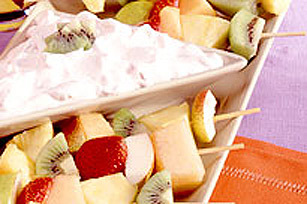 Serve with skewered fruit kabobs. Try a combination of strawberries, pineapple wedges, diced kiwi fruit, cubed melon and pears.